Felice Carena, La fuga in Egitto, 1940 ca. Olio su tela, 90x110 cm. Collezione Privata. VENICE.- Venice is dedicating a major exhibition to Felice Carena (Cumiana, Turin 1879  Venice, 1966), undisputed luminary of the Italian Novecento. The show is a tribute to the artist from Piedmont who spent the last, prolific years of his career in Venice. Promoted by Regione del Veneto, Istituto Veneto di Scienze Lettere ed Arti and Arthemisia Group, the exhibition Felice Carena e gli anni di Venezia (Felice Carena and the Venice Years) is on view through 18 July 2010, in the prestigious venue of Palazzo Franchetti. Following the exhibition in the same venue dedicated to Zoran Music which ended on 7 March, the event continues with the commemoration of artists with Venetian links, rediscovering a great painter like Felice Carena who has long been absent from the exhibition scene. Fifteen years after the show held in Turin in 1996, the Venetian exhibition represents the first great opportunity to rediscover and reappraise his work thanks to a new critical assessment that highlights the artists Venetian period and also reviews his lengthy career, with its many different influences and constantly evolving style. Curated by Virginia Baradel, the show is presided over by a prestigious exhibition committee that alongside the curator comprises Luigi Cavallo, Elena Pontiggia and Nico Stringa. The event, coordinated by Stefano Cecchetto, gathers more than 90 works from leading Italian museums and private collections, tracing the path of Carenas artistic career from his youthful period in Turin to the agonising Pietà and the lavish Nature morte of the final years. The exhibition features exemplary masterpieces such as I Viandanti (1907, GAM, Udine), Ritratto dun sacerdote (1913, Galleria Internazionale dArte Moderna Ca Pesaro, Venice), Bambina sulla porta (1919, Fondazione Giorgio Cini, Venice), La Quiete (1921-1926, Banca dItalia), Apostoli (1924, GAM Palazzo Pitti, Florence), La scuola (1927-1928, Monte dei Paschi), Uomo che dorme (1938, Galleria Comunale dArte Moderna e Contemporanea, Rome), Teatro popolare (1933, GAM, Milan), and many other important previously unexhibited or rarely shown works, such as the stunning Deposizione (1938-1939), exceptionally on loan from the Vatican Museums, La fuga in Egitto (ca 1940), Il Ratto delle Sabine (1942) and the central nucleus of the controversial work Dogali - 1887 (1936), recently rediscovered and being exhibited once more for the first time on this occasion. Felice Carena was born on 13 August 1879 in Cumiana, near Pinerolo, into a middle class family from the provincial area around Turin. He studied at the Accademia Albertina in Turin, following courses by Giacomo Grosso. He frequented the intellectual and literary circles of the city, and became friends with Giovanni Cena and Guido Gozzano, before moving to Rome in 1906 and becoming part of the cultural scene in the capital. He undertook numerous study trips around Europe (to Paris, Basel and Munich) and by 1910 he was already fairly famous. He emerged as the revelation of the 1912 Biennale, where despite his tender age he was given a solo room, and became a key figure in twentieth century painting. Much acclaimed between the two world wars, prince of the Florentine Accademia, Accademico dItalia and winner of the Grand Prix at the 1940 Biennale, in the post war period Carena nonetheless found himself labouring under the shadow of an insidious ideological and artistic ostracism. In 1944 he left his villa in Florence, which was occupied by the Germans, and retreated to the San Marco convent, before moving to Venice the following year. In the city of Titian and Tiepolo and the Biennales he continued to paint until his death, surrounded by the affection of his beloved daughter Marzia and his old friend Gilberto Errera. Venice healed his wounds and offered him a new start in life and work. He exhibited at the Biennales of 1950, 1954 and 1956, and in numerous exhibitions in Italy and abroad in the 1950s and 60s. Loyal friends included Giuseppe Roncalli (the future Pope John XIII) and Vittorio Cini. In 1951 he painted the altar piece with S.Pio X in the Church of San Rocco, and in 1963 a Deposizione for the Carmini Church. He continued to paint prolifically up to the beginning of 1966, when he began to suffer from serious problems with his eyesight. On 10 June he died in his house on fondamenta Briati (Dorsoduro). He left various paintings and 25 drawings to the Cà Pesaro Gallery and a group of 60 drawings to Fondazione Cini. The exhibition is designed to look like a collection of paintings, fitting in beautifully with the magnificent setting of Palazzo Franchetti. A selection of masterpieces and exemplary works is presented in chronological order, illustrating the various episodes in Felice Carenas artistic career and capturing the originality and distinctive quality of the painting from his Venetian period. The first section is dedicated to his early aestheticised, crepuscular period with its overtones of symbolism and sentimentalism. These were the Turin years, when the artist absorbed the teachings of Grosso, as well as Bistolfi and Segantini, whom he was more drawn to. This section includes some of the masterpieces from the early 1910s, like La Perla (1908), Ritratto della Baronessa Ferrero (1910); various previously unexhibited works like Ritratto della sorella of 1901 and the Violinista of 1905, and the two famous paintings La rivolta (1904) from the Accademia di Belle Arti in Rome and the monumental I viandanti (1908) from the Gallerie dArte Moderna di Udine, which mark his transition from late Romantic aestheticism to the literary vehemence of the social criticism he engaged with in his early Roman period. The second section explores the pivotal developments of 1913. In 1913 and 1914, Carena reached his first artistic turning point, looking to the French artists Derain, Gauguin and Cézanne. He eliminated haziness and languor from his work, defining volumes, shaping line and purifying his style of composition. His stays in the unspoilt rural hamlet of Anticoli Corrado contributed to this new vision, which is expressed most consummately in works like Ritratto dun sacerdote (1913) from the Galleria Internazionale dArte Moderna di Ca' Pesaro, Gualfarda (1914) and the masterpiece Bambina sulla porta (1919) from Fondazione Cini. Exhibited for the first time are the paintings La guardiana dei porci (ca 1916), Corsa nei sacchi (1919), Aringhe e uova (1920) and Natura morta con fiori, that Carena took out of the 1914 Biennale because Fradeletto had dared to express some reservations about the new direction of his work. The war, that he experienced from the front line, accentuated his quest for a pared down expressive style, which is reflected in his personal approach to classicism, looking to the seventeenth century, albeit in the context of the Valori Plastici group and the Novecento current of the early 1920s. 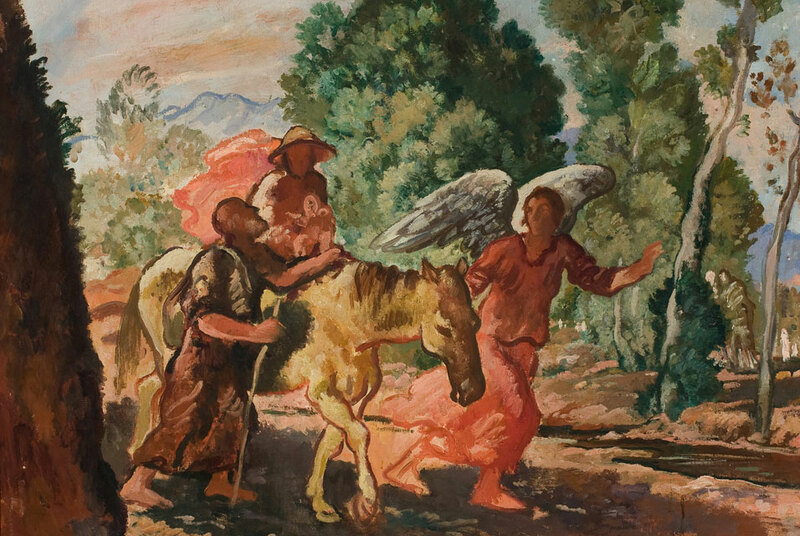 The masterpieces from this period can be seen in the third section, represented by two extraordinary paintings like Quiete (1922-24) and Apostoli (1924): figures modelled by light that emanate a sensation of tranquillity and composure yet also convey an echo of Cézannes work in their make-up. The portraits of his daughters and his brother don Mario Carena, on the other hand, herald the developments of the 1930s. The fourth section is dedicated to Carenas "poetic realism", the unmistakeable hallmark of his work. Biennales in Venice and Quadriennales in Rome saw him acclaimed as one of Italys leading painters, and in this period his approach to naturalism changed, leaving the classical canons in favour of an increasingly harsh, rough, expressive brand of realism. Quintessential examples of this style are paintings that made him famous, such as La scuola (1928) which won him the Carnegie Prize in Pittsburgh in 1929, Lo specchio-studio (1928) from Musei di Genova, Il terrazzo (1929) from the Gallerie dArte Moderna in Udine, La pergola (La famiglia sotto la pergola) (1929) from the Galleria Comunale d'Arte Moderna in Rome, Figure in maschera (1932) and Bagnanti (1938) from the Museo Rimoldi in Cortina. The gem of this section is the extraordinary Deposizione (also known as Pietà and exhibited at the 1940 Biennale) from the Collezione d'Arte Sacra Moderna in the Vatican Museums (purchased by conte Cini and then donated to Pope Paul VI), which was exceptionally loaned for the Venetian exhibition. This section also contains two masterpieces, Teatro Popolare (1933) from the Galleria darte Moderna in Milan and Uomo che dorme (1938) from Romes Galleria Comunale. The section ends with the painting Dogali - 1887 (La battaglia di Dogali 1887) (1936), the painters only concession to Fascist rhetoric, which aroused much controversy at the 1936 Biennale because death is portrayed as tormented rather than heroic. The painting was subsequently cut up by Carena himself, though leaving the magnificent central hub intact. After a careful search this was recently rediscovered and is now being exhibited again for the first time. In the fifth section, after the tribute to Delacroix in l'Angelo lotta con Giacobbe (1939) from the Gallerie dArte Moderna in Udine and Tobia e lAngelo (ca 1938), we come to a group of paintings that date back to the end of the 1930s and the beginning of the 1940s, the period that culminated in the important exhibition at the Galleria Michelangelo in Florence in 1943. This was the only solo show he staged in his adopted city, where he rose to success as a painter and as director of the Accademia. Carena was now working with maximum luminosity, a trend that heralded some of the artistic developments of the subsequent Venetian period. This section boasts various paintings that have never been shown before, like La fuga in Egitto (ca 1940), where the warm colour palette of reds and yellows highlights the delicate dynamism of the group of pilgrims, L'annuncio ai pastori (1941), Il ratto delle Sabine (ca 1942) and La conversione di Saulo (ca 1937), where the movement becomes more animated and the colours lighter and more contrasting. The sixth section presents a series of paintings that have never been exhibited before, and that date back to Carenas move to Venice. Works like l'Esodo (ca 1945), Pioggia di Fuoco (1943), Passaggio del Mar Rosso (1945), Busto di Marzia (1946), Autoritratto (1946) and Bagnanti reveal his use of colour as pure chromatic matter, ever less held in check by the line, done in a freer and more gestural style. Increasingly dense, sinuous line and a brighter impasto characterise the works of the late 1940s, in which the artist appears to look to Daumier, transforming his folk, mythological and biblical heroes into grotesque, highly dramatic figures, be it Caino e Abele (1947) or Giuditta e Oloferne (ca 1948) or a simple Pastore (1950). This is the style that emerges in the 1950s, the period explored in the seventh section, when Carena reached the apex of his religious sentiment; the line is vibrant and the colour vigorous and macerated. The figure of man and Christ on the cross come closer: the Christ in the last Pietà, and every human who identifies with the agony of Calvary, become the focal point for the suffering and abandonment that Carena so consummately expresses in his Venetian period. The works in this section - Teatro popolare (1952) from Ca Pesaro, Pietà, from the Galleria Civica di Vittorio Veneto, Angoscia (La madre) (1952) from the Collezione Marzotto and the previously unexhibited Davide e Golia (1953) - exude an intense expressionism. The exhibition ends with the eighth section, which like an area of natural purification, gathers the artists still lifes. The Venetian light appears to have soothed Carenas spirit. Inspired by Tiepolo, and also by his contemporary Morandi, he fuses matter and light in the solid and highly symbolic bodies of still lifes dominated by shells. In the chromatic weave of the painted surface he maintains the sumptuousness and solemnity of the Baroque vein, while the balanced composition forges a thoughtful blend that unifies space, light and matter. In this setting his colours acquire a gem-like gleam, that secret splendour present in all of Felice Carenas work that conveys his unceasing, pulsating love for life. Mid-Career Survey of American Artist Ed Templeton at S.M.A.K.